Skin Cancer Checks are pain-free and easy ! Book now for your skin cancer check appointment. Usually a 20 minute appointment and just for the same fee as a consult. Here in Australia we have the highest rates of skin cancer in the world. Those who have never had a skin check before or who have risk factors are recommended to see one of our skin cancer doctors. If you have noticed changes, then our doctors can examine and explain more. Skin cancers can appear even on areas of the body that are not exposed to the sun. Your risk factors will be assessed and explained to you. Suspicious moles will be identified and explanation given. A plan of action will be advised and a full explanation of what you require as a next step will be given. Fees: Our skin cancer doctors here charge the normal consultation fee based on time. A skin check normally takes our standard 15-20 minute consult. If you have a high mole count then it may be a longer consult. The Skin Cancer Check is a whole body skin examination. During a skin check we will normally ask you to undress down to your underwear. You will lie on the examination couch and the doctor will examine your skin using a dermatoscope. Any lesions needing further detailed examination will be closely checked to see the patterns within the spot with a remarkable amount of detail. Several studies have shown that doctors trained in the use of dermoscopy have a high degree of accuracy in detecting skin cancers. Any lesion which appears to be suspicious will be noted and explained to you. Our doctors will discuss with you the need for a biopsy (where a small part of the lesion is sent for pathological examination) or excision (where the lesion is removed). Some moles require only observation, which may involve the use of digital photography to monitor the mole. We also have a reminder system for those patients that have skin types requiring regular checks e.g. annually, six monthly etc. We will notify you when it is time to return for your checkup. Your risk factors will be assessed and explained to you. Suspicious moles will be identified and explanation given. 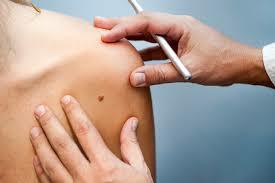 Fees: Our skin cancer doctors here charge the normal consultation fee. A skin check normally takes our standard 15-20 minute consult. If you have a high mole count then it may be a longer consult. During a skin check we will normally ask you to undress down to your underwear. You will lie on the examination couch and the doctor will examine your skin using a dermatoscope. Several studies have shown that doctors trained in the use of dermoscopy have a high degree of accuracy in detecting skin cancers. Any lesion which appears to be suspicious will be noted and explained to you.